Over the latest years, the concept of the cloud computing and cloud services penetrated into a wide variety of life and business areas. Today, the cloud services are provided by the large number of companies around the world, among them there are Amazon, Google, Netflix, Microsoft, Apple, IBM, HP, Oracle, and many other companies well-known in a sphere of information technologies. Ones of the most famous and reliable cloud service platforms today are the Amazon Web Services from Amazon.com Inc. and SmartCloud from IBM Corp. Despite the fact that only now the cloud computing received the most popularity, its development history originates from the mid of the 20th century, and Salesforce was the first company that provided the enterprise applications over the Internet, in 1999. 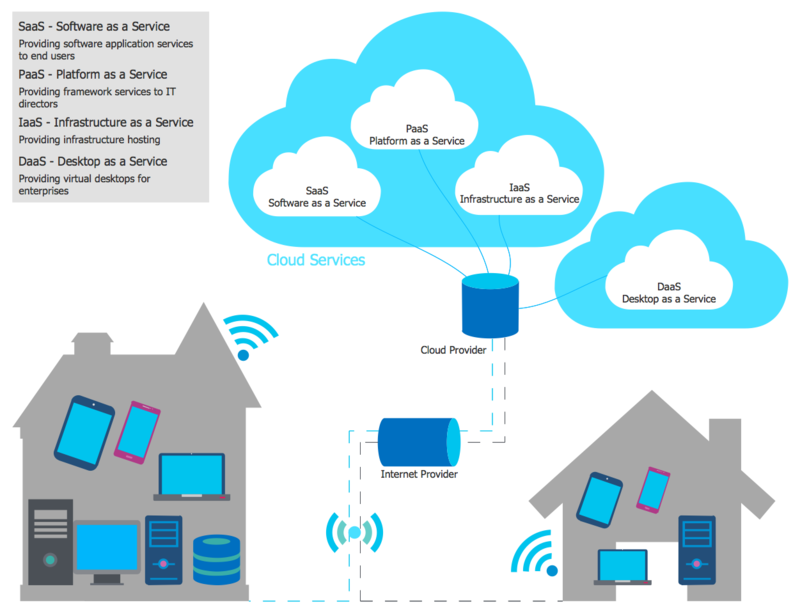 The popular cloud computing information technology concept implies the convenient access to the shared network computing resources and data for computers and other devices on call. At this, all applications, software and data required for a work are provided to the users as an Internet service. Being physically located on a remote server at the Internet, the applications are running and displaying results of their work in a standard web-browser window on the local computer or other used device, while the technical details of this process are hidden from the user. Thus, the cloud computing allows users and organizations with different computing capabilities to store and to process the data in the clouds, on the remote servers located at the data processing centers, the precise location of which is often unknown, but they are typically equipped with the latest high-tech hardware that many companies and organizations cannot afford to possess at the place. For the description and visual representation of the Cloud computing architecture, for displaying the essence of the cloud computing, the main characteristics and classification of the cloud services are designed the Cloud Computing Diagrams, which use the cloud symbol as the abstraction for the complex network infrastructure and other commonly accepted cloud computing symbols and pictograms. The Cloud Computing Diagrams solution extends the functionality of the ConceptDraw DIAGRAM diagramming software with a comprehensive collection of libraries of cloud computing vector stencils to help you to get started designing Cloud Computing Diagrams, Architecture Diagrams and Cloud Computing Architecture Diagrams without efforts. This solution lets one professionally depict the way how the cloud computing works, allows giving a powerful introduction to the Cloud computing architecture and Amazon cloud computing architecture thanks to the wide variety of predesigned samples and examples. There are 4 libraries containing 492 objects in the Cloud Computing Diagrams solution. There are a few samples that you see on this page which were created in the ConceptDraw DIAGRAM application by using the Cloud Computing Diagrams solution. Some of the solution's capabilities as well as the professional results which you can achieve are all demonstrated here on this page. All source documents are vector graphic documents which are always available for modifying, reviewing and/or converting to many different formats, such as MS PowerPoint, PDF file, MS Visio, and many other graphic ones from the ConceptDraw Solution Park or ConceptDraw STORE. The Cloud Computing Diagrams solution is available to all ConceptDraw DIAGRAM users to get installed and used while working in the ConceptDraw DIAGRAM diagramming and drawing software. This diagram was created in ConceptDraw DIAGRAM using the libraries from the Cloud Computing Diagrams Solution. An experienced user spent 5 minutes creating this sample. This Cloud Computing Diagram sample shows a Cloud computing architecture and infrastructure, and visually explains the work principles of the Cloud computing technology. According to the Cloud computing concept, the applications run and display the results of their work on the screens of desktops, laptops, phones, or tablets, while the applications themselves and the data necessary for their work are located in the cloud — on a remote server on the Internet. So, the Cloud computing technology hides many technical details from the users and makes them invisible, however allowing the users to use different hardware and software from the cloud. Design in a moment your catchy Cloud computing diagrams, maps and infographics in ConceptDraw DIAGRAM diagramming and vector drawing software with the help of predesigned vector and scalable cloud objects, icons, clipart and connectors from the libraries of the Cloud Computing Diagrams solution from the Computer and Networks area of ConceptDraw Solution Park. This Cloud computing infographic sample illustrates three main types of the cloud computing: private /internal, public /external and hybrid. A private cloud is a cloud infrastructure intended for use and operated by solely one organization. A public cloud in its turn is intended for free use by the general public, its services are provided over a network opened for a public use. At this, the architecture of a public and private cloud may have a little difference or may not, as opposed to the security considerations that can differ significantly. As for a hybrid cloud, it is a combination of various cloud infrastructures, of at least one public cloud with at least one private cloud. A hybrid cloud combines the ability to access a huge range of public cloud applications and services, as well as the main advantages of the private clouds that guarantee high reliability, security of storage and processing the information. This diagram was created in ConceptDraw DIAGRAM using the libraries from the Cloud Computing Diagrams Solution. An experienced user spent 10 minutes creating this sample. The Cloud Computing is a model that provides convenient on-demand network access to the set of a large variety of configurable computing resources. The Cloud Computing is often outlined as a stack because the cloud joins a lot of services constructed one over another. This Cloud computing diagram sample designed in the ConceptDraw DIAGRAM software shows the cloud computing layers accessible within a stack. You can see the following layers on the diagram: Cloud Clients (e.g. Browsers, Devices), Cloud Application (e.g. SaaS or Software as a Service, which is designed for the end-users and deployed over the Internet), Cloud Platform (e.g. App Server) and Cloud Storage (e.g. Database), and Cloud Infrastructure (e.g. Physical / Virtual Hardware). Please give particular attention to the color style of your diagrams, including Cloud computing diagrams, because a successful use of colors and the ingenious choice of color spectrum will make your diagrams vivid and attractive. The cloud marketing describes the marketing and advertising methods, activities, and efforts made by a certain company or an organization to promote and to sell its services and goods to the end users or the target customers using the websites, online applications, online portals, social media and social network websites, such as Facebook, Telegram, Twitter, and so on. Thus, the application of a cloud marketing undeniably has great advantages in the different fields of business, it is quite effective in a field of advertising, promotion and sales, it is cost effective and customizable, and it lets one decrease the cost of advertising materials through the use of digital mailing instead the printing materials. This Cloud computing diagram sample designed with the help of tools of the Cloud Computing Diagrams solution for ConceptDraw DIAGRAM is a prime example of a Cloud marketing diagram, which illustrates the layout scheme and workflow of the cloud marketing platform. This diagram was created in ConceptDraw DIAGRAM using the libraries from the Cloud Computing Diagrams Solution. An experienced user spent 15 minutes creating this sample. 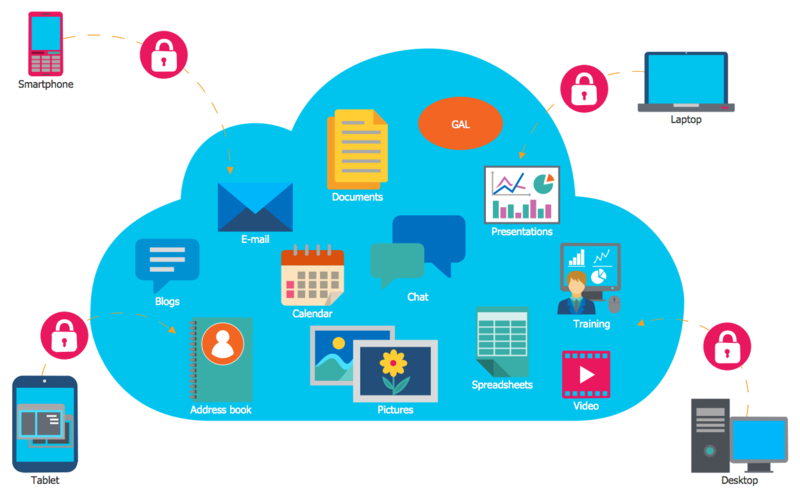 This diagram visually demonstrates the structure and components of the IBM SmartCloud, which is a kit of cloud computing services developed by IBM company and intended for business. The IBM SmartCloud computing services allow its customers to store, to find and to extract their data, to protect them, and to recover important information in minutes in case of some emergency. The IBM Cloud is delivered by public, private or hybrid models and contains the IaaS (Infrastructure as a service), SaaS (Software as a Service) and PaaS (Platform as a service). Since 2011 the IBM cloud service is used successfully equally with similar AWS (Amazon Web Services), Rackspace, and other large cloud platforms. Designing this SmartCloud Model or any other Cloud computing model you may not think about the need of special painting or designing skills, because everything you may require to draw professional diagrams, you already have within the ConceptDraw's Cloud Computing Diagrams solution. This Cloud computing diagram illustrates a variety of applications in the cloud. Using different electronic and networked client devices the users can have on-demand access to the applications from a cloud. There can be listed smartphones, tablets, laptops, desktop computers, Ethernet-enabled devices among such devices. This access is possible due to the cloud computing technology and is realized by means of its mechanisms. Some cloud applications support a special client software, other ones use a web browser to interact with a cloud application and do not require special software installed at the client’s, and some business applications are delivered via the technology of a screen sharing. At the focus of this chart there is a cloud object available from the Cloud Clipart library included to the Cloud Computing Diagrams solution, the other objects are also taken from the libraries of this solution and are located on the diagram inside the cloud and around it. This infographic depicts a selection of four well-known cloud services offered according to the different models: infrastructure as a service, platform as a service, software as a service, and data as a service. Infrastructure as a service (IaaS) is a cloud-based solution within which a vendor provides users with an access to different computing resources, such as servers, storage, networks. The platform as a service (PaaS) is a cloud solution that provides users with a cloud environment, in which they can develop their own applications, also manage and deliver them. Software as a service (SaaS) is a kind of cloud solution, which delivers users an access to the vendor's cloud software, thus the applications are located in a remote cloud network and users don't need install them on their local devices. Desktop as a service (DaaS) is a model providing a fully ready to work standardized virtual workplaces, additionally customizable to fit the users' needs. 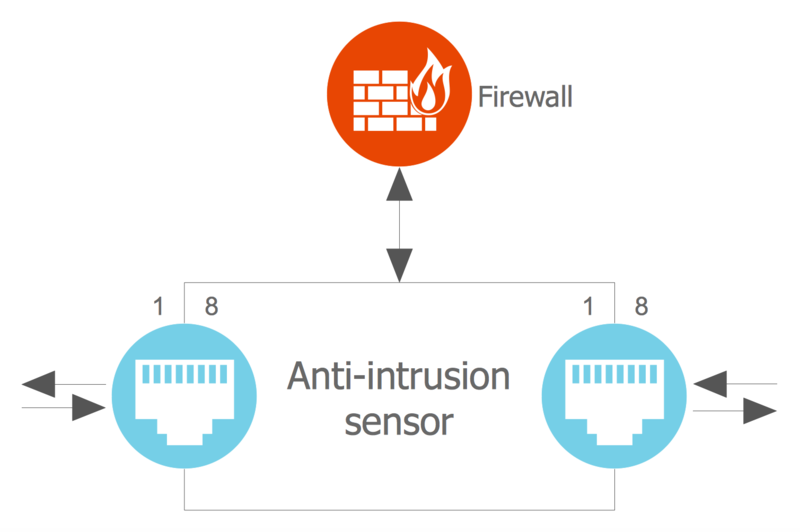 This example illustrates the architecture of an anti-intrusion sensor for the cloud computing. The use of Anti-intrusion System and Intrusion Detection System (IDS) is useful and even obligatory nowadays. The IDS is a kind of defense system that lets one detect any criminal activities in a network and actions that put the system's security under a danger, such as the hostile activities, hacking attempts, scanning of ports, security breaches, intrusions, hackers' attacks, insider attacks, and other attacks aimed at the computing and networking resources, as well as identify an intruder, reply correspondingly on these malicious activities with a goal to prevent their negative influence. Each ConceptDraw DIAGRAM user can find this sample at the ConceptDraw STORE and use it as a quick-start to design its own diagrams representing the processes related to networking and cloud computing. The vector objects from the solution's libraries will help you to cope with this task quickly and efficiently. This Cloud computing diagram illustrates the architecture of IBM SmartCloud, which is a set of cloud computing services delivered by the IBM Corporation. You can see that the IBM SmartCloud includes the infrastructure as a service (abbr. IaaS), software as a service (abbr. SaaS) and platform as a service (abbr. PaaS), which are offered using varied cloud delivery models, such as public, private or hybrid. 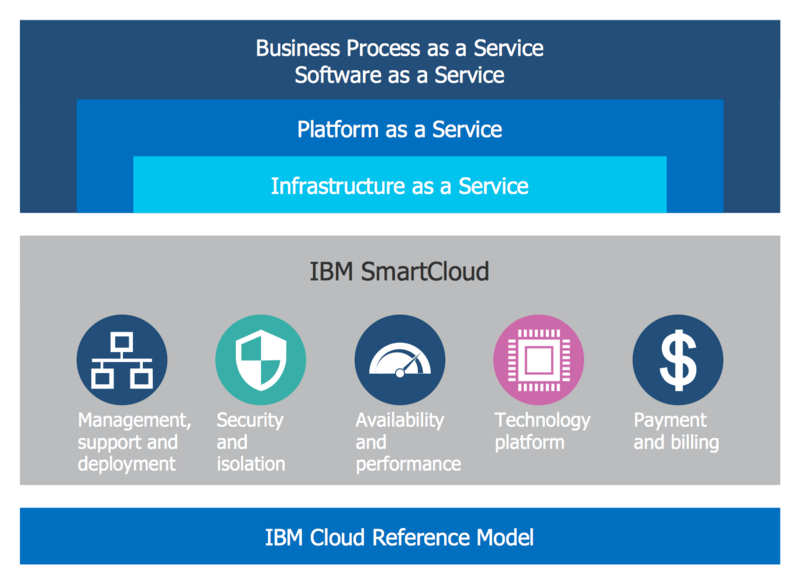 This information is accurately and consistently displayed on the diagram, as well as the information about services and characteristics of IBM SmartCloud, among which are management, support and deployment, technology platform, payment and billing, security and isolation, availability and performance. This diagram was drawn basing on the Wikimedia Commons file SmartCloud diagram.jpg and at the use of drawing tools of the ConceptDraw DIAGRAM software and vector objects from the libraries of powerful Cloud Computing Diagrams solution from the Computer and Networks area of ConceptDraw Solution Park. 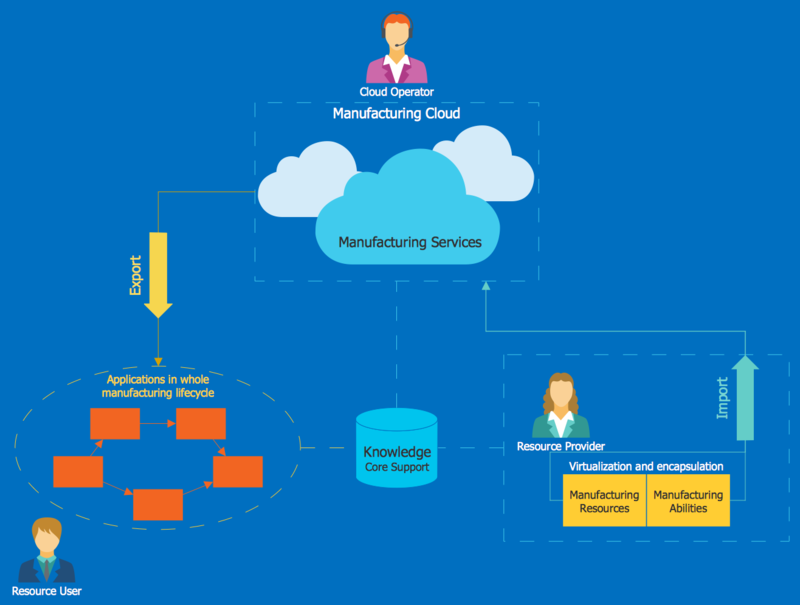 This diagram demonstrates the Principal cloud manufacturing and was created with the tools of ConceptDraw's Cloud Computing Diagrams solution on the base of the file from Wikimedia Commons licensed under Creative Commons Attribution-Share Alike 3.0 Unported license. The Cloud manufacturing (abbr. CMfg) is a manufacturing paradigm covering such advanced manufacturing models, technologies and concepts as a network manufacturing (NM), manufacturing grids (MGrid), virtual manufacturing (VM), agile manufacturing (AM), Internet of Things (IoT), service-oriented technologies, computing technologies, cloud computing and enterprise information technologies under the cloud computing support. The cloud manufacturing is a model of a universal and convenient access to the general pool of manufacturing resources and manufacturing capacities, which are turned into the cloud services and are managed centrally so that in a moment the clients can use them at their discretion. The undoubted advantage is that the Cloud manufacturing is able to provide the high-quality, low-cost, reliable, and secure manufacturing services for the entire manufacturing life cycle. Both ConceptDraw DIAGRAM diagramming and drawing software and the Cloud Computing Diagrams solution can help visually represent how cloud computing works. The Cloud Computing Diagrams solution can be found in the Computer and Networks area of ConceptDraw STORE application that can be downloaded from this site. Make sure that both ConceptDraw DIAGRAM and ConceptDraw STORE applications are installed on your computer before you get started. After ConceptDraw STORE and ConceptDraw DIAGRAM are downloaded and installed, you can install the Cloud Computing Diagrams solution from the ConceptDraw STORE.